We are open five days a week and our hours of operation for appointments are from 8:00 a.m. to 8:00 p.m. Monday through Thursday and 8:00 a.m. to 6:00 p.m. on Fridays. ACGC’s Walk-In Clinic operates on Fridays from 2 p.m. to 4:00 p.m. No appointment is necessary for a Walk-In session. 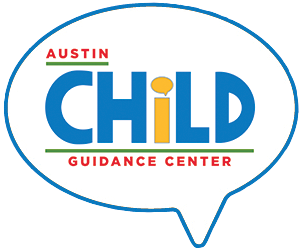 What services does Austin Child Guidance Center provide? Individual, family and group counseling for children; youth, adolescents and their family members; in-depth psychological assessments; psychiatric services (for children in therapy at the center); parent workshops; and trainings, for full details visit our Services page. ACGC serves the Austin community and the surrounding areas, including Cedar Park, Round Rock, Hutto, Kyle, and Buda. Clients travel from as far as Marble Falls, San Marcos, and Bryan to receive services. What is the cost and what are the payment options? Call the Intake Specialist at 512-451-2242. The Intake Specialist will gather the necessary information to determine if ACGC services are appropriate for your family’s needs. Be advised that an initial request for service phone conversation typically lasts 10-20 minutes. We request that parents or guardians call and speak with an Intake Specialist to schedule appointments. This helps to ensure that you are scheduled with an appropriate therapist based on your needs. What if no appointments are available? ACGC does not keep a waitlist for therapy services. ACGC has a weekly, no appointment needed Walk-In clinic every Friday from 2:00 p.m. to 4:00 p.m. Call (512) 451-2242 for more information. ACGC uses a waitlist for psychological assessments. Due to high demand, ACGC does not keep a waitlist for therapy services. The waitlist for psychological assessments varies; please call the center and speak with an Intake Specialist for current wait times. For more information, see Appointment Scheduling. As much as possible, ACGC strives to provide trained volunteers in the waiting area to positively interact with waiting children. When available, these volunteers can supervise your children while you speak to a therapist, however, please do not leave the building grounds while your children are on site. If your child’s behavior becomes disruptive or dangerous, you will be asked to return to your child. If your child is here for group therapy, please accompany him/her into the building and remain on site, as the therapist may need to speak with you. ACGC is located centrally at 45th and Lamar, and is on 5, 338 and 803 Capital Metro bus lines; buses 1 and 801 are about ¼ mile away. The agency recognizes that many families have difficulty accessing our central location, and has many projects out in the community. Contact the Intake Specialist at (512) 451-2242 for more information.